Julie is still looking for this dog, plus we have a mailing list of people looking for it, too. I’m looking for a stuffed animal dog with long ears and limbs and beads in its feet that made it heavy. His pajamas are light blue and textured. He is made by Happiness Express, and he is approximately 18 inches long. I can’t remember where I bought the stuffed dog, but it may have come from Walmart or possibly ABC Distributing. My daughter has just remembered this stuffed dog that we think she left in my mother’s house after she passed away. She can’t quit thinking about that stuffed animal, and I am afraid that it has a lot do with losing her grandmother. I need to find a replacement for her. I know this little dog – he has long legs and he weighs a ton. Hi pajamas are light blue and textured. He is made by Happiness Express. He is approx, 18 inches long. He looked familiar to me, but I couldn’t remember any specifics. Thanks so much! We can’t help you Lyndsie if you don’t Contact us, so we can email you information! I was out at sales this weekend and I found your dog. I knew soon as I saw it, grabbed it. Washed it. Snoozems, TM 1995 Happiness Express INC.
Julie if you win the auction I am willing to ship to you free if that helps the cost. Throw some fuzzy ears on this Happiness Express Ears, and it would look a lot like the dog. Yes Tami, the pink bear looks a lot like the dog. Must be the girl version. Too bad! I am still looking for this dog, but i can not pay $110 dollars on ebay. the right one will come along. I am very thankful for all the help. I bought my sisters two stuffed animals from the happiness express club ( the maker of the puppy stuffed toy you are talking about). I originally bought them at Kay-bee toy store. I went back the two years later and they were gone. No website either. Leslie, are you trying to find one? If so, you need to Contact us. I am too looking for one of these stuffed animals. i used to have the bear with the pink outfit when i was little and am dying to find another one. if anyone can help me find one, please let me know. thanks so much! Ashley we can't help you unless you Contact us!! Thanks, Brian. I don’t know that any of them would be interested in the rabbit, but I appreciate your information. Thanks, Leeann and Tami. Ive sent these, as well as the two we have in our own store, to the mailing list. When it’s a mailing list you only need to comment on one post. I’ll send the link to everyone. Hi I just came across this website. I am trying to sell my Happiness Express Club Inc Snoozems. Copyright 1995-96. I have four of them, the kitten, hippo, rabbit and puppy. If anyone is interested please let me know. They are in excellent condition. I am very attached to the puppy, so the price would have to be right. Thanks! I am looking for the puppy dog or the rabbit, I had one when I was a little girl and my daughter who is 5 has my old one but its looking pretty rough and I want to keep it for memories and start a new one for my daughter. Does anyone know where I can find one I’ve looked on eBay and can’t find anything but the bear in pink pajamas? I have a few left to sell but its the white kitten, and the hippo. I have the dog but I can’t part with him! If interested please email me at MXBritt20@yahoo.com thanks! 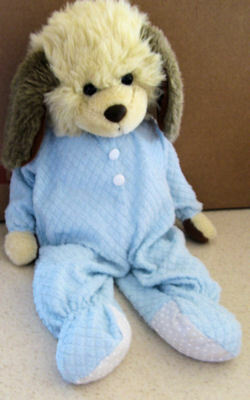 I had the puppy in the blue pajamas when I was younger. My mother got rid of it a while ago, and I am now trying to find it again. If anyone can help me find one I would greatly appreciate it! I have the puppy but I don’t think I could part with him! I have the little snoozems dog. I was going to sell it on ebay. Anyone who is interested can contact me. I will hold the dog for a while and wait to see if anyone wants it. It is in good condition. Would you be able or willing to post pics or send me some? I’m interested in buying the pup! I have this little dog!!! I’m 21 now and my dad recently found him and fixed him up for me. The one in the picture looks like a newer edition of mine. I took mine everywhere as a child. His name was “puppy”. The bean bags all fell to one leg and his head came off but after a little stitching, he’s perfect! I remember when getting him at a “KB toys” when I was 5 or 6 years old. Good luck! Thanks for sharing, Jay! The fur on yours is matted, but probably looked like the one in our post when it was new. kB toys. And his faded little tag says happiness expess. Hope you have some success. Thank you to this website for helping me find this dog. Not only finding it but also still in the box. I am also looking for this dog! I got my sister one for her 2nd Christmas and she still has it, but it is matted, with no nose and no beans. I would love to surprise her with a “newer” looking one! Please let me know if you can help! I found this dog somewhere in a garage sale or something. My daughter is two years old and loves it! However, it is a bit worn. I am having a little boy in April and would love one for him. Even if it isn’t the same dog, or I find a girl version for my daughter and trade it, etc. Thanks! Hey! I grew up with the dog and also called him puppy! I can remember giving him a haircut. Like many of you are saying, he’s all tattered and matted and his head fell off! Please help me find another one. It would mean very much!! If anyone comes across one my email is Kellbell2987@hotmail.com. Thanks! I’ve been searching for a new one for my little cousin but I haven’t found any anywhere.. I’m sure they’re discontinued and a new one would be rare. I’d love to see a new one but I don’t think I could ever replace my matted little “puppy”. I had this when I was little.. it was my favorite thing in the world but I lost it when my house burnt down. I’m in college now and I would really like to get a new one! If anyone has any information on where to find it I would really appreciate it. I’ve been looking for a dog stuffed animal like this one for a long time. When I was a little girl I had one. His name was Tim Tim and I loved him. Would hardly let my mom wash him. Now I am expecting a child of my own and I would really like to have one of these. If anyone is selling one please email me asap. Thanks.